I was cheering for Julie Culley to win the 5000m race at the U.S. Olympic Track and Field Trials. Not because the other women racing didn't deserve a spot but because she was the only person in the field, aside from Julia Lucas who won the Bank of America Shamrock Shuffle in March, who I knew. As luck would have it, I read about Culley's track accomplishments three years ago and interviewed her for the Mid-Atlantic edition of Competitor magazine. Back then, Culley was 28 years old. She worked part-time at Pacers Running Stores in the Old Town section of Alexandria, Va. She coached track and cross-country at American University. 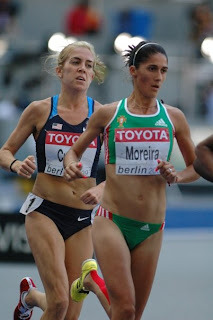 She was a relative newcomer to the professional circuit when she ran the 5000m at the 2009 IAAF World Championships in Berlin--it was only her third time on a world championship team with indoor track in 2008 being the first and cross-country in 2009 being the second. She ran a personal best while racing in Belgium to qualify for Worlds--she ran another personal best to win at Trials. And she had goals of qualifying for the 2012 Olympics and said she was determined to make it happen. How was the experience at the World Championships? Worlds was much different than any other team and the experience was beyond any other. The whole city of Berlin was involved in the meet, and the stadium was sold out EVERY DAY. It was extremely significant because it was the first time a world championship was held in Berlin's stadium since the 1936 Olympics. The U.S. team made quite a big deal about this because it was also the Olympics where Jesse Owens cleaned up for the U.S. on the world's stage. My parents and family friends were in Berlin, too, so we had a wonderful time exploring. It was truly awesome! Did you expect or hope to finish as you did? No, I actually hurt myself mid-race--having strained my adductor magnus near my hamstring--and missed my goal of making the final. I was the fittest I had ever been in my life and was excited to see how far I could go in Berlin. My body didn't agree with me. I was disappointed, but excited for the future and I hope to make more teams down the line. What are some of your favorite memories from being at the World Championships? Lining up for my race was pretty special. Any time you wear the USA uniform, there is no prouder moment. I really enjoyed watching the races too. It's so much fun cheering on your fellow teammates and watching world records fall. The energy in the stadium was unlike anything I've ever felt. Should we look for you on the 2012 Olympic team? experience. 2012 is my goal and I'm prepared to train as hard as it takes to achieve that. Julie will race for 5000m gold alongside teammate Molly Huddle this afternoon; she already ran a personal best 15:05.38 on Tuesday to nab a spot in the finals. Photo courtesy of Julie Culley.